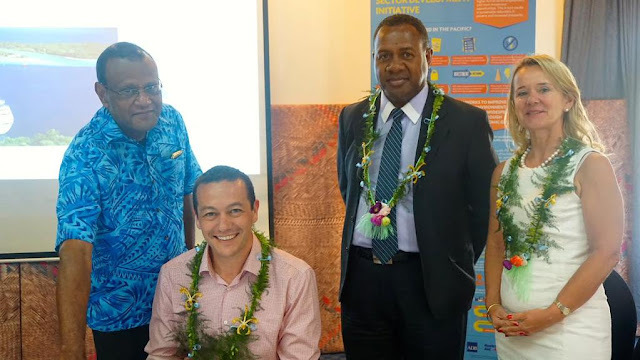 Vanuatu Financial Services Commission (VFSC) Commissioner George Andrews, PSDI Business Law Reform Expert Aaron Levine (seated), VFSC Board Deputy Chairman Lionel Kalaut and ADB Pacific Liaison and Coordination Officer Regional Director Andrea Iffland at the launch of Vanuatu's online business registry in Port Vila on 31 August, 2015. An online business registry supported by PSDI has been opened in Vanuatu. The registry allows both Ni-Vanuatu and overseas investors to register and maintain business details and pay fees online. It will reduce the average time for company registrations from more than 3 weeks to under 3 days. The convenience, online payments and digital reminders of the registry are expected to increase compliance with business regulations, while its online search functions will increase transparency and international business confidence. The opening of the registry represented the culmination of a series of PSDI-backed legal reforms that will dramatically simplify doing business in Vanuatu. These reforms include the recognition of new corporate structures, such as one-person companies that encourage women to register a business independently, and community companies, which allow communities to run a business and ensure the profits from it are shared fairly. The registry was launched by the Commissioner of the Vanuatu Financial Services Commission George Andrews and Deputy Chairman of the VFSC Board Lionel Kaluat at a ceremony attended by representatives from the private sector, the ADB, and the governments of Australia and New Zealand. An extensive public awareness raising campaign to inform people about the functions and benefits of the registry is underway. Meanwhile, training sessions are being held around the country with individuals working in sectors that are likely to be heavy users of the registry. The registry can be found at www.vfsc.vu. PSDI Business Law Reform Expert Aaron Levine can be heard discussing the benefits of the registry on ABC Radio here.